design driven accessories for your home and garden. We are first and foremost designers and as such we are committed to providing our wholesale customers with fresh, imaginative, beautifully designed products at affordable prices. Our unique line of garden ornaments, from our huge metal sunflowers to our daffodils and lilies are each handcrafted works of art. In addition we offer a line of classic wrought iron furniture made in the European tradition of hand forged heavy iron with hand finished marble tops. Our fabulous chandeliers, delicate rose mirrors, ornate gates and arbors create an old world ambiance. We also offer architectural antiques including huge carved doors, old iron gates and other one of a kind pieces. Our warehouse is conviently located in South San Francisco across from A. Silvertri Statuary on Bay Shore Blvd and is open by appointment. 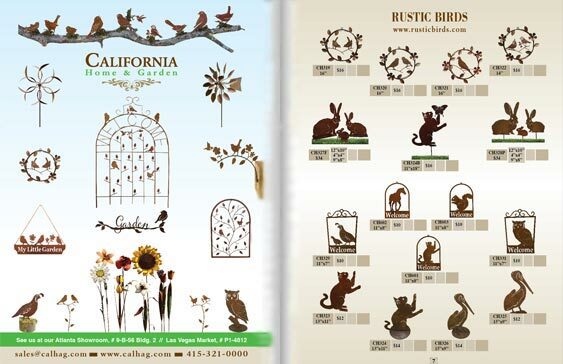 Copyright © 2019 California Home & Garden, All Rights Reserved.